Say it with me now — shēn-ˈwäz-rē. The term, and the style, dates back to the 17th and 18th centuries, when the French had their way with certain Asian motifs, symbols, and icons. And while chinoiserie certainly flows in and out of favor — in, in the '30s and '80s; out, just about every other decade — it never really goes away. It was there, in your Great Aunt's house back East, or at those stodgy estate sales. If you're tiring of straight-up minimalism, it's time to see chinoiserie anew. And the 21st century take on it — "Modern Chinoiserie," per Jess Bunge, senior market editor at Style by Emily Henderson — is refreshing. I, for one, am here for it. "The real trick to Modern Chinoiserie is picking your 'moment,'" says Emily Henderson, when Hunker asked for her take. "Whether it's something small like a little collection of ceramic vases or a big statement like wallpaper, let that be the only piece in the chinoiserie style. This way, it shines and keeps the room from feeling too visually intense." You don’t have to go full pagoda. Sotheby's Home points to the hallmarks of chinoiserie — dragons, foo dogs, cherry blossoms, landscapes, and pagodas. All of which are great, but you can simply embrace certain shapes and figures. The legs on a table or chair, or the lines of a headboard, can be enough to convey "Asian" without going overboard. This is not decorating on a budget. Chinoiserie ain't cheap. Vintage pieces on Chairish and 1stdibs easily run in the thousands. It helps to think of the real deal as vintage investment pieces, or hew to less expensive accessories, like pillows, prints, and decorative china, that you can swap in and out at will. For me, it all started with the fabulous Hybrid line of china by Seletti. 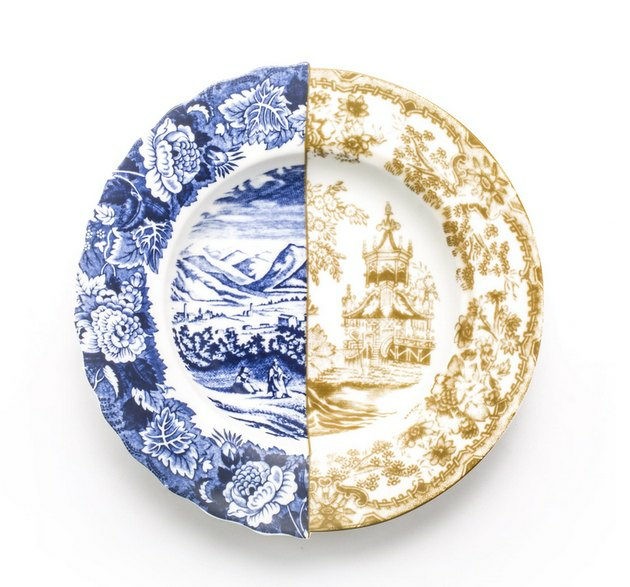 Each delightful piece is half Asian, half British bone china, fused together. Three of these now hang in my kitchen. Then I picked up some delicate porcelain dishes at a yard sale, which now house soap and matches in the bathroom. And I've been eyeing a vintage chinoiserie bowl on Chairish for months. Each piece adds a new layer and brings something colorful and whimsical to my otherwise modern-eclectic space. Did you hear? Old-school room dividers are back — and it's a perfect way to add chinoiserie flair to an otherwise minimal or modern room. And, luckily, chinoiserie plays well with others. So long as you heed Emily Henderson's advice — use your chinoiserie sparingly — it'll fit right in with most existing designs. It's a natural fit for Hollywood Regency, and a surprising counterpoint to midcentury modern style. Detailed chinoiserie prints look pretty glam next to Greek key designs and animal print, and a grand chinoiserie accent wall can be the exact statement you want to make.